The proverb, “Give a man a fish; you have fed him for today. Teach a man to fish; and you have fed him for a lifetime” applies to gardeners too. While you can give several houseplants for the holidays, giving a gardener (or potential gardener) a pack of seeds can lead them down a path of self-exploration, garden activism, an understanding of their role as stewards of heirloom plants in the garden, and within their community. 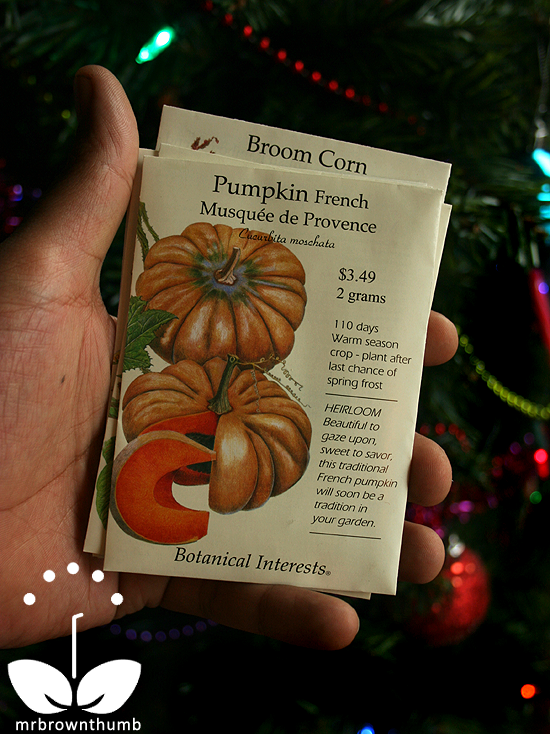 Seed packs make great stocking stuffers because they are relatively inexpensive. There are a few seed companies that really produce seed packs that can capture the imagination and inspire a gardener to get their hands in the dirt. Below are four examples of seed companies that create exceptional seed packs that you can stuff a gardener’s stocking with this Christmas. The Hudson Valley Seed Library’s seed packs are my favorite seed packs. Each seed pack is a unique piece of art created by an artist that enters a yearly call for artists. The mediums used to create the artwork for each seed pack varies from artist to artist. As does how each artist chooses to represent the seeds inside. Sometimes they’re graphics, paintings, or illustrations that interpret of the plant’s name. 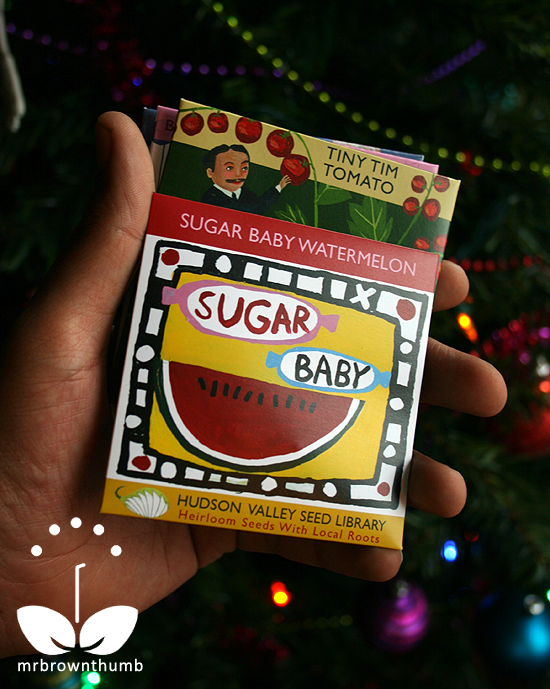 A handful of seed packs from the Hudson Valley Seed Library is like holding an art exhibit in the palm of your hand. Botanical Interests seed packs are similarly artistic. The front of each seed pack is decorated with an original botanical illustration by one of a handful of botanical illustrators contracted by the seed company to produce the artwork for the seed packs. On the surface the illustrations may all look alike but after you’ve examined a few seed packs you start to develop an eye for identifying which artist created the artwork for the seed pack. Renee’s Garden seed packs have been decorated by botanical illustrations since Renee founded her first seed company, Shepherd's Garden Seeds. 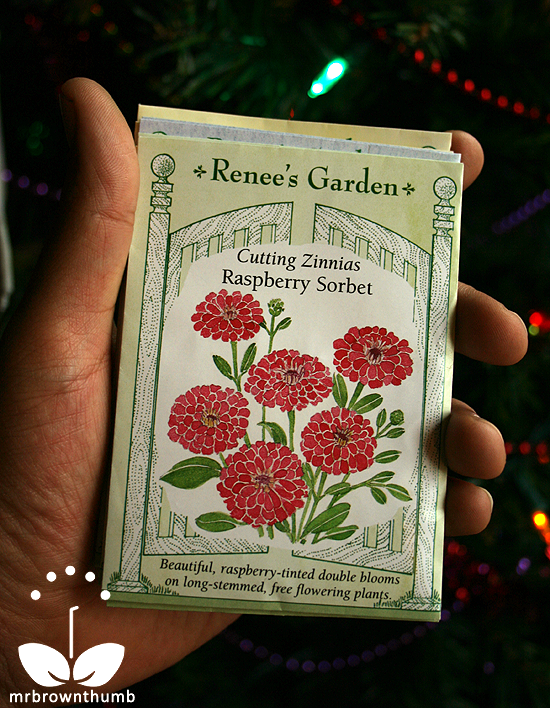 Mimi Osborne, a botanical illustrator, has designed every seed packet for Renee's Garden. Mimi's illustrations of plants, flowers and vegetables have graced the seed packets for over 25 years. Renee decided to use illustrations instead of photographs before it became stylish for modern seed companies because she believed that sometimes the stock photos could be misleading to the gardener. The Baker Creek Heirloom Seed Company has two types of seed packs. The light seed packs are usually an illustration, while the black seed packs, like the one pictured above, use photographs of the fruits or vegetables. Both seed packs are larger than standard seed packs but the black ones are my favorite because they’re so striking and not as feminine as say the art for Renee’s Garden or Botanical Interests. Around the holidays Renee’s usually has sale and the sale’s coupon code is posted on her online seed catalog. Botanical Interests includes a free desk calendar featuring botanical illustrations with online orders during specific dates in December. If you are buying seeds for a gardener and don’t trust your tastes to match up with those of the recipient you can give them a gift certificate to one of the companies or a membership, in the case of the Hudson Valley Seed Library, and let them choose the seeds they want to grow. If you’re on a budget save on shipping by buying Renee’s Garden, Botanical Interests and Baker Creek Seeds at finer independent garden centers near you. 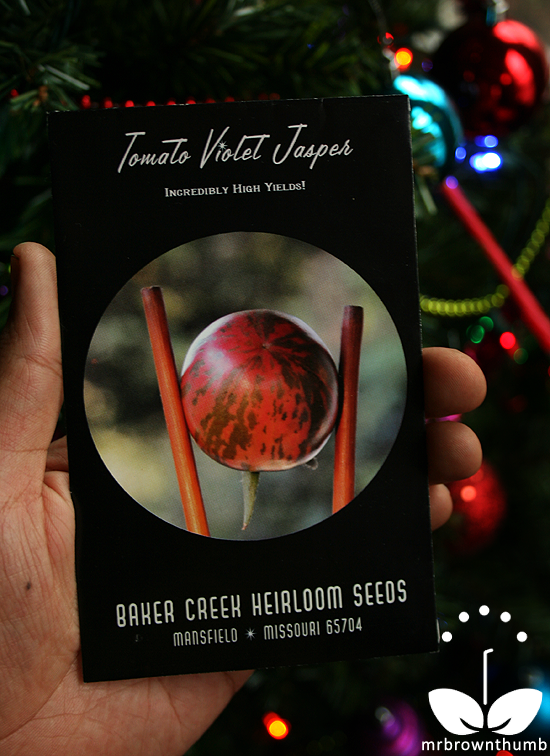 There are many fine seed companies that carry heirloom seeds that you can buy from to fill stockings with during Christmas, these are just some of my favorites because their seed packs are beautiful. For a more personal touch you can gift gardeners seeds you saved from your own garden and create your own unique seed packs. What’s important in the act of giving seeds is that you’re passing on history and inspiration to a fellow gardener. Substituting candies and chocolates with seed packs in the stocking of a child can teach them the benefits of healthy eating and an appreciation of nature. 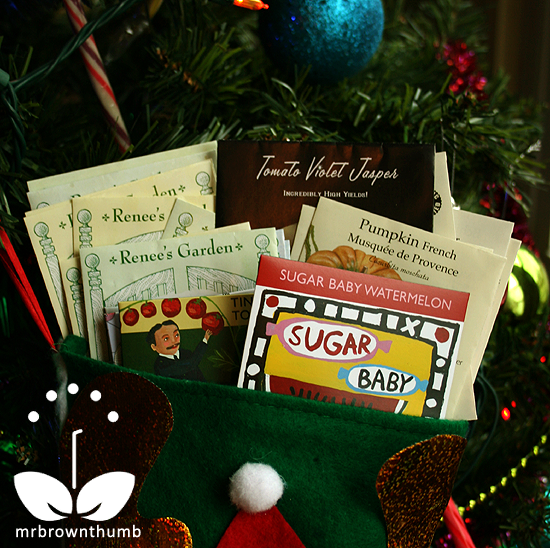 Using seeds as stocking stuffers can demonstrate that you're paying attention to a gardener's interest by gifting them something they actually want and need. Do you give seeds during the holidays? What are your favorite seeds to include in stockings? Well, you just helped me figure out what to get my best friend for Christmas, Mr BT!!! These seed packettes are so pretty! One thing we are always on the look out for here are Kale seeds...so I am on a quest now to find beautiful Kale seed packs! No more boring packs for me!!! THANKS!!! I may design my own, now that I think about it! I like all of the above, but that Hudson Valley seed pack is so cool. Some great looking seed packets...can't wait to start putting in orders for next season. What a good idea. Ms. Claus may need to run out and get a few for webb's stocking ... oops! that's me! it could still happen. Even though I can pick from a warehouse full of seeds, I still like getting them for gifts. My favorite seeds this time of year are micro-greens and sprouting seeds. They fulfill my American need for instant gratification. At any rate, I love the promise of spring that seeds bring this time of year. I find myself shuffling through them like the baseball cards of my youth and envisioning the results to come with anticipation. I had never heard of Hudson Valley Seeds. Their website is very nice and I like their offerings. I am so happy!!! I just placed 6 orders with Renee's Seeds! I could climb through the computer and kiss you Mr. GT!!! I would LOVE to get seeds in my stocking instead of sweets. I really love those seed tins from Peaceful Valley (or Grow Organic). Renee's Garden seeds are really lovely and perfect for first-timers & small garden spaces since the packets don't have thousands of seeds in them, I've done Think Spring cards before for friends with her lettuce seeds in them, trying to encourage people to plant something! I think saving your own and making nice packets would be a fab idea - I've done this before. Big fan of Renee's Garden seeds...she just a little south of us down in Fulton I believe. Baker's is one too that I have seen in our hood. Like their new look of the seed packets. Great suggestion to get seeds for stocking stuffers. Thanks everyone! I hope you all got some seeds in your stockings this year and are having a happy New Year.